Tom Voyce is a quick outside back who can play on the wing or at fullback. His great uncle, Thomas Anthony Voyce, won 27 caps for England and went on to become the president of the RFU between 1960 and 1961. Voyce began his career at Bath, rising through the junior ranks and making his debut against Saracens in 1999. He made his debut for England against the USA on the tour of North America in 2001. Voyce spent six years at Bath, making 79 appearances and scoring 25 tries for the club, before joining London Wasps for the 2003/04 season. He quickly became an important member of a successful Wasps side, and his potent club form was rewarded with a return to the international arena. Between 2004 and 2006 he played eight times for England, but a poor performance against Australia in Sydney on the 2006 summer tour led to his omission from subsequent squads. He moved to Gloucester for the 2009/10 season. 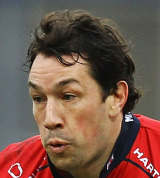 Although he looked to be disappearing from frontline rugby, he increasingly forced his way into the starting XV at Kingsholm during the 2010/11 season.